"Good Morning," I said to my children. They stared back at me blankly with no response. I wondered if they could not hear me. They were sitting there like statues, again I said "Good Morning." I then realized that I couldn't even hear her own voice! I thought, "this cannot be happening to me." Tests revealed my worst nightmare: throat cancer....and HIV. I felt my world crumbling down right before my eyes. I did not know what to do. Fortunately, I met a lady named Mary Wanderi who introduced me to Africa HEART's Women Equality and Empowerment project (WEEP) program that supports women living with HIV/AIDS who are abandoned and helpless. I was a bit skeptical about the idea, but later found out that the women in WEEP had gone through the similar experiences to me (or even worse), but they were still holding on to hope. It was while at WEEP that I met Vickie Winkler, founder of HEART. I found new hope through HEART! WEEP catered for my food, paid the school fees for my children, paid for rent and medication and began to teach me how to provide for my children. It was like a dream after all I had been through! I am so thankful to God for this program. HEART gave me emotional and financial support at my lowest point and has helped me build my skills and take care of my family. 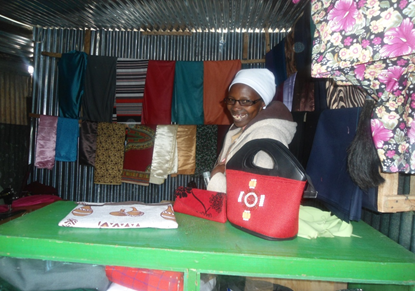 I have gained tailoring skills, graduated from the program and now own my business. I have now employed four people. I can now pay some of the school fees for my children and provide for their needs. When speaking, I use an electro larynx to amplify my voice. I am HIV positive, raising my three children all by myself and earning an income through my growing business. "I am thriving!" Dorcus in her new shop. This is the story of Dorcus Wanjiku, an Alumni of WEEP which is Africa HEART's Orphan Prevention program. Its goal is save the lives of mothers suffering from advanced stages of AIDS, sparing their children from becoming orphans. 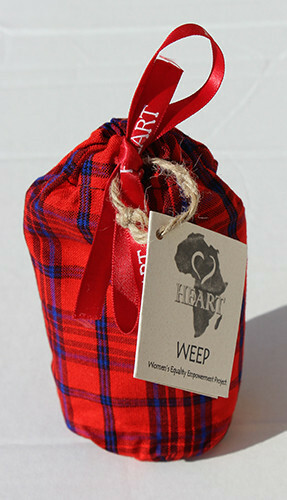 Africa HEART is "Empowering the people of Africa to survive and to thrive beyond the HIV/AIDS pandemic." Working with vulnerable women infected with HIV/AIDS and their children, HEART provides medical care, nutrition, shelter, access to ART (Anti-Retro Virus Therapy) psychosocial, protection, income generating skills and educational support to their children for HIV positive mothers who have been widowed or abandoned. HEART operates in eight different impoverished areas of Kenya. Women go through three Phases of WEEP program: Stabilization, Skills Development and Sustainability. Once physically stable, the mothers are taught a trade at a WEEP center to enable them to become self-sufficient and to break the cycle of poverty. When they graduate from WEEP, they are able to make use of the various skills learned such tailoring, beadwork, business management, empowering them manage their business and sustain their families. The WEEP program currently supports 231 women and has 145 WEEP alumni. Africa HEART aims to graduate 86 women in the year 2015 and enroll 100 new women. Sample of the tea bags, an income generating activity through WEEP, that helps Dorcus earn a living. Although the Kenyan government has taken positive steps to address the HIV epidemic in Kenya and to advance women's reproductive health and rights, much work remains to be done and that is why HEART is at the forefront to support these HIV/AIDS mothers. We are keeping mothers alive, healthy, and employed, and protect their vulnerable children from becoming orphans.